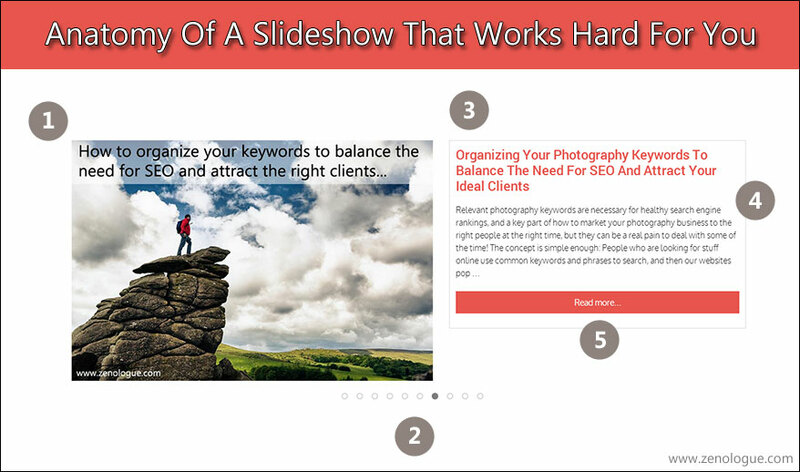 Is Your Website Slideshow Hurting Your Photography Business? Could your website slideshow do actual harm to your photography business? An unusual question, for sure, but one that my marketing mentoring students are all too familiar with! On our weekly mastermind calls, one of the running gags refers to my collection of well-worn “website slideshow boxing gloves” – so-called because everyone knows how I feel about those generic “me-too” slideshows that inhabit photographer websites all over the Internet. A lot of photographers find this attitude a little strange, some even think I’m off my rocker for even daring to suggest such heresy as a slideshow actually hurting a photography business! To some, I’m sure, it must seem as mad as saying that art galleries are bad for art! So why does the humble slideshow deserve so much grief? Where does all this nonsense come from? I promise I’m not normally an annoying person – or at least, I try hard not to be – but have you ever been on the receiving end of a seemingly endless series of questions that all sound suspiciously like “why”? Kids are experts at this. To someone struggling to figure out this mad world in which they find themselves, “why?” seems to be the logical next question to everything. Like I said, I try not to be annoying most of the time but, when it comes to business (especially when dealing with commonly-held beliefs) I like to separate, as much as possible, conventional wisdom from conventional foolishness. So I tend to ask “why?” a lot! Does it always result in great insights? No, of course not. But, sometimes, it can reveal things we thought were right as being quite wrong! Just like the case of the Emperor’s new clothes, an impression held by the majority is not always the right one. Why Does The Website Slideshow Feel So Necessary? Whenever I suggest to a group of photographers that slideshows as we know them need to go, it’s like a scene from an old Frankenstein movie when the angry villagers take up their flaming torches and pitchforks to deal with the evil monster once and for all! Not quite the desired reaction, but not quite unexpected either. The problem with these arguments is that they’re all flawed wrong! As with the overused idea that “photography is my passion“, your photography will not sell itself, and those thousand words we imagine a photograph is worth are actually no clearer to the reader than a whisper in a hurricane. What Is The Intended Purpose Of The Website Slideshow? If you’ve been around here for any length of time, you’ll know that another of my favorite questions is:“Why does your website exist?”The answer to that question is, of course, to generate viable leads for your photography business – nothing more than that. If the website slideshow is going to be an integral part of that scenario, what can we say about its intended purpose? It would seem reasonable to say that slideshows must make a valuable contribution to the process of turning visitors into leads, and that anything the slideshow does to hinder that process or hurt the conversion rate should be avoided at all costs! Does a random collection of images, as attractive as they may be, actually move someone closer to your goal of becoming a lead, or does the system rely too heavily on the prospect doing what you want them to do without being prompted? However, standard slideshows, like the one above with some of my holiday photos from a trip to New Zealand, are clearly not designed from a marketing perspective. Sure, they do a great job of showing off a photographer’s work, but then stop short of capitalizing on the interest they generate! As frustrating as it is, you’re left to watch helplessly as the prospect leaves your website – never to be seen or heard from again! A Website Slideshow That Earns Its Keep! The alternative is to use a slideshow that both shows AND tells! When used this way, your images and words work together in harmony to create a strong synergy that connects with your prospect in a much more deep and meaningful way. Because, she not only sees your photography, she can also understand the story that exists outside the frame, as it were. That’s where the emotional context can be made, and it doesn’t always have to be the tearful kind. For example, even for commercial photography, words can paint a more complete picture, and make a compelling narrative for the images being presented. The image itself – obviously, the most important part of the slideshow from a visual standpoint! However, the images in this website slideshow are “featured images”, and can be clicked on to visit the page they refer to, rather than being used with no purpose. A non-intrusive navigation bar appears at the bottom of the slideshow for the user to skip to specific slides if desired. A textual headline (again, linking to a post or page), designed to capture attention and create interest. An excerpt of the target post or page is shown to further involve the reader and provide more information that can encourage them to click through. A highly-visible “read more” link appears at the end of the excerpt as a call to action. How Will YOU Re-Imagine Your Website Slideshow? Will you ever look at the humble website slideshow in quite the same way again? At the end of the day, remember that your website is your sales representative, and its only job is to convert prospects into leads. Your slideshow can either work toward that goal, or against it. Are you going to keep playing the old game, just because that’s what everyone else is doing? Take a look around – most of the other photographers out there are struggling.